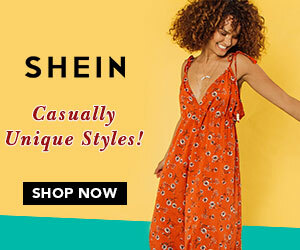 I am sure there will be something for everyone and I just cant deny the absolute affordable options from Shein.com. Go check them all out. 1. Pretty Pastels: Let those soothing sorbet hues dominate your wardrobe this season and No! Pastels don’t just mean pretty & safe, you can very well make a Statement by pairing them with other trending fabrics like denims, feathers, sheer and so on. 2. Flowy Maxi dresses: The breezy summery vibes that a printed Maxi dress can bring to your weekend outing is unmatched. Play with prints and colours from florals to checks to ruffles and puffs. 3. Tear away Track Pants: Yes they are back and How. When you are trying to style the ‘90s sportswear trend, try to keep the top in the same color scheme or at least in a solid color. Don’t mix more eye catchy patterns like fringe feathers or ruffles for the top. Let your legs take the attention. SHEIN Contrast Tape Side Plaid Pants – A modest and chic way to sport the track pants trend. ​4. Ruffles, Frills & Twists: Yes, don’t mix them with tear away pants but for sure rock this trend on its own and in all of its glory. 5. Stripes and Checks: The most basic and the most stable and yes the most edgy of them all. 6. Sequins: It can get a lil tough to sport a all sequin look in summers but try to carry a lil bit of them on your crop tops with distressed denims and voila you are fashionable and Summer ready both. 7. Play with the sleeves: The comfy and pretty bell sleeves trend is still here with lot more variations to choose from. Puff sleeves and Flutter sleeves are going to be BIG. Stock on ‘em. And I am particulary a fan of how a simple puff sleeve on a solid colour top makes for a chic Formal outfit too. 8. Fringe and Feather it: Considering that we are not the Runway models I understand that one cannot go all out in trying these trends but a lil fringe & feather here and there can serve the purpose very well. 9. Plastic: Plastic seems to be big on trend too, though couldn’t find the wearable options from the same trend, will surely update in case I get my eyes on something which is easier to carry in routine lives setting. I have put the links of my Favorite picks for each of the trends (Couldn't put all the pictures as there were so many of them).. But you can check all that out, as all it will take is a click and we ll be ready to rock the summers. I would absolutely love to see you wearing one of my choices so don’t forget to tag me whenever you flaunt it on any of your social handles. Wow, I am already drooling over the trendy outfits you shared. My fav of the season are pastels and floral maxi dresses. Will be selecting something cool from your collection. Shein is always frontrunner to showcase latest trends. I'm loving the Sequins trend which is back with a bang and here to stay. Also love sleeve details. Eyeing tht gorgeous yellow maxi too. Oh, I'm so in love with the florels!! And perfect for the season. I love clothes by Shein. They are the only ones that I trust when it comes to online shopping. I lukl their floral mid dresses and shirts! I really like all the dress options here. These are all perfect for upcoming warm weather. Those floral prints are my favourite. They are perfect for Spring summer. you know, i have always been scared of experimenting with my looks and i stay very close to the things that work on me, but these ideas have got me thinking, about how i can mix things around.